We are a small indie team based out of Massachusetts who make games during our spare time. Please expect Glitch's Trip to be a challenging platformer, where every death feels like a lesson closer to victory. We really hope you enjoy playing our game and we greatly appreciate any feedback in the journey to evolve Glitch's Trip. 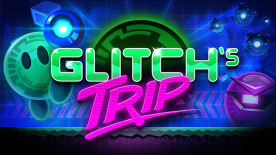 Glitch's Trip is a tough twin-stick platformer where you play as Glitch, a gooey green ball of space alien, who is trying to survive in worlds dominated by deadly alien bullies. You'll leap over seas of lava, rave in fluctuating gravity, blast baddies that want to ruin your day, and glitch through hundreds of near death experiences. Take on 100 (50 currently in Early Access) bite size levels that you can play during any chunk of time. No need to wait! Quick spawns and fast level loads make it so you're always in the action. Equip power ups to help survive in this luminous experience. Glitch out to survive the most craziest of situations. Build your own levels with the in game Level Editor.